Born in Bia, Hungary, in 1922, Simon Hantaï settled in France in 1948 and joined the surrealist circle of André Breton. After experimenting with a variety of painting techniques in the 1950s, he saw Jackson Pollock's work, which offered a way to push beyond both surrealist automatism and European gesturalism. Inspired by Pollock's pouring of paint onto horizontal canvases—leaving behind self-conscious style for a physical engagement with the medium—in 1960 Hantaï invented a method of pliage (folding) that defined the rest of his career. With many variations over the course of five decades, Hantaï's pliage entailed applying paint to bunched or knotted canvas and then stretching the canvas to produce a traditional rectangular painting, but one marked by a lack of visual control verging on blindness. "Through folding I put my eyes out," he reflected in 1997, referring to a childhood episode of temporary blindness induced by diphtheria and also evoking Pollock's radical repositioning of the artist "in" the painting rather than at a comfortable distance from it. In Hantaï's first paintings using this method, he obsessively filled the canvas, following Pollock's all-over structure. Then, in the Meun series of 1967–1968, he allowed the white of the primed canvas to penetrate and define his monochromatic forms. With this step, inspired by the cut-outs of Henri Matisse, Hantaï achieved what he called "the unpainted made active," something he pursued ever further for the rest of his career. Étude is an early example from Hantaï's next and arguably most important series: the Études (1968–1972). Here the artist has combined the all-over structure of his first pliages with the use of reserved canvas in the Meun series. He has multiplied the number of knots and reduced their scale, producing a dense pattern that is at once fractured and sublimely decorative. 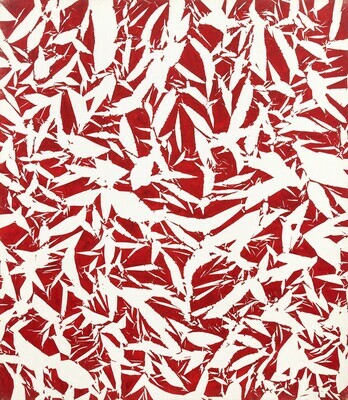 The lyrical suggestion of birds or foliage is held in check by the aggressive red color and the violent intervention of the primed canvas, the "unpainted paint." Viewers are dazzled as they attempt to decide whether the white areas (which are deliberately given as much of the surface as the red) constitute figure or ground. Photograms come to mind, with their direct production of silhouetted images by blocking or admitting the passage of light onto sensitive paper. Through his experimentation, Hantaï developed a unique way of maintaining beauty while acknowledging the radical skepticism about authorship, control, and self-expression that has characterized painting after Pollock. Hantaï was a major figure in France, inspiring the Supports/Surfaces group in particular. The Gallery has three drawings by the artist from the Rosenwald Collection; this first painting by Hantaï greatly strengthens the collection of postwar European art. The artist [1922-2008]; his estate; purchased 3 April 2012 through (Galerie Jean Fournier, Paris, and Paul Kasmin Gallery, New York) by NGA. Simon Hantaï, Gallery Kasahara, Osaka, 1982, repro. Simon Hantai, Musée national d'art moderne, Centre Georges Pompidou, Paris, 2013, no. 108, repro.